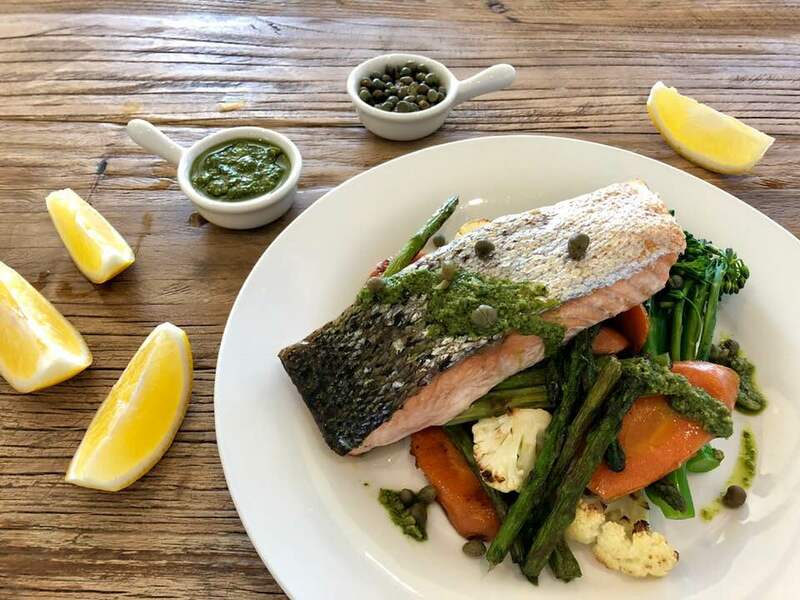 A most loved Australian fish, salmon is an excellent source of high-quality protein, vitamins and minerals (including potassium, selenium and vitamin B12). The high levels of omega-3 fatty acids give salmon the reputation as a valuable ‘brain food’. These fatty acids are thought to contribute to healthy brain function, heart function, joints and general wellbeing. Pre-heat oven to 180oC and line a baking tin with baking paper. Place carrots on the tray, drizzle olive oil, sprinkle with salt and pepper, and roast for 15 minutes. Remove tray from the oven, add remaining vegetables, coat them all in olive oil, and bake for another 15 minutes. In the meantime, line a separate baking dish with baking paper, place the salmon fillets on it, skin side up, lightly drizzle with olive oil, and sprinkle salt on the skin. Bake for 10 to 15 minutes depending on size and thickness of salmon fillets. Serve with Parsley and Capers Sauce. Directions: Blend all ingredients in a food processor.